Should You Be Eating White Rice? Dr. Axe here and today I am answering the question, “Is rice healthy” and explaining the difference between white rice and brown rice. I believe there is validity to both but it depends on the person and on the preparation of the rice. Rice Pros: • Whole grain brown rice is high in B3 which is good for heart health. • Whole grain brown rice is high in selenium which supports the thyroid and kidneys. • Certain types of rice contain GABA, a neurotransmitter, that can support the brain and helps reduce anxiety as well as support metabolism. 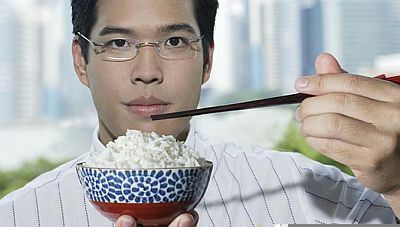 if rice is soaked and sprouted then it unlocks the vitamins and minerals versus most rices that aren’t sprouted. I personally consume an organic rice from the company, True Roots. It is a germinated brown rice (soaked and sprouted) which kills off phytic acid and is easier to digest. In Chinese medicine, look up “qi” or “chi.” They believe that short grain brown rice increase your body’s “qi” which is your body’s life source and energy. It is considered to be one of the #1 healing foods and I suggest to my patients to make a “congee” with chicken bone broth, brown rice and vegetables such as carrots, and celery. This chicken vegetable rice soup is healing and nourishing to the body. In conclusion, is rice healthy? Yes, it can be if you are doing sprouted rice that is traditionally prepared. Simply, stay away from white refined rice that is void of vitamins and minerals and can cause a spike in your blood sugar and insulin levels. What do you think about rice now? !